Obesity means having too much body fat. It is not the same as being overweight, which means weighing too much. A person may be overweight from extra muscle or water, as well as from having too much fat. "Crash" diets are best for losing weight and keeping it off.The correct answer is myth. Crash diets that severely limit calories aren’t safe or successful. They often don’t have enough vitamins and minerals. Most people who try crash diets overeat again and gain weight back. The safest way to lose weight and keep it off is with regular exercise, smaller portions, and a healthy diet.Healthy snacks between meals can help people manage their weight by:The correct answer is both A and B. Some snacks can be bad for the waistline, but not all snacks are equal. Healthy snacks are good for you because they’re nutritious and can make you less hungry between meals. They also can also boost your energy in the middle of the day or when you exercise.Foods labeled "lite" or "light" will help you lose the most weight.The correct answer is myth. The word "lite" or "light" can mean lower calories or fat, but sometimes not enough. There is no set standard for that word. Some of these foods may be reduced in fat but have more added sugar. If a product says "lite" or "light," read the label very carefully.The most important thing about exercise is:You’re more likely to stick with your exercise program if it’s fun and motivating. It helps to have a clear goal. This might be improving your health, reducing stress, exercising for longer, or being able to buy smaller clothes. Do what you enjoy, whether it’s dancing, yoga, karate, or bowling.If I’m trying to lose weight, I can’t eat fast food anymore.The correct answer is myth. Most fast food is loaded with calories, fat, sugar, and salt -- but you can still try to make healthier choices. Look for fast-food places that offer salads, soups, and vegetables. Choose items that are roasted, grilled, baked, or broiled instead breaded or fried. Split meals with a friend.This can help you stay on track with your weight loss while eating in a restaurant:The correct answer is all of the above. If you plan ahead, it is possible to eat out and enjoy yourself while staying healthy. And once you know how to pick the right foods and the right amount of foods, you can eat at almost any type of restaurant.Obese people don’t try hard enough to lose weight.The correct answer is myth. There are many reasons why some people can’t keep weight off. Biology is a big factor. Our bodies have a complex system to help keep weight at a healthy level. Our eating habits are the products of how we were raised, where we live, and many other factors.Which of the following is NOT a good way to help kids get to a healthy weight?The correct answer is B. Do not punish, tease, or put down children who are not motivated to lose weight. This won’t help them. Praising and rewarding them when they are active and make good food choices will encourage them to stay with it. The best thing you can do to motivate your kids is to lead the way and set a good example.Weight-loss surgery (bariatric surgery) cures obesity.The correct answer is myth. Bariatric surgery can jump start weight loss for obese people. But surgery alone is not a cure for obesity. Weight-loss surgery can train you to eat less, but you still need to watch your diet and exercise after the surgery. Talk to your doctor about whether weight-loss surgery is right for you.In addition to losing weight, being active and eating healthy can help you:The correct answer is all of the above. With so many good reasons to maintain a healthy weight, why not start eating better and moving more today? Friends and family can be a great source of support. Ask them to join you on your journey to a healthier lifestyle -- they’ll be glad you did. 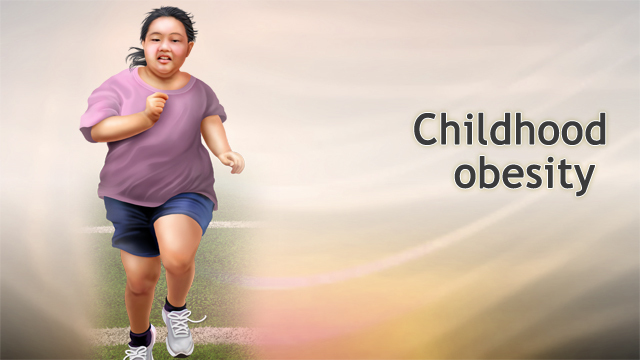 Studies indicate obese children overwhelmingly tend to stay overweight into adulthood. The way we eat when we are children can affect the way we eat as adults. The way we eat over many years becomes a habit. It affects what we eat, when we eat, and how much we eat. We may feel that we are surrounded by things that make it easy to overeat and hard to stay active. Many people feel they do not have time to plan and make healthy meals. People with little free time may have less time to exercise. The term eating disorder means a group of medical conditions that have an unhealthy focus on eating, dieting, losing or gaining weight, and body image. A person may be obese, follow an unhealthy diet, and have an eating disorder all at the same time. Quitting smoking -- Many people who quit smoking gain 4 to 10 pounds (lb) or 2 to 5 kilograms (kg) in the first 6 months after quitting. Stress, anxiety, feeling sad, or not sleeping well. Menopause -- Women may gain 12 to 15 lb (5.5 to 7 kg) during menopause. Pregnancy -- Women may not lose the weight they gained during pregnancy. 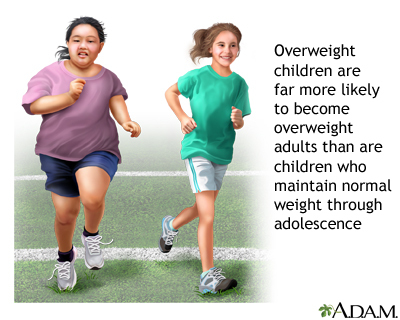 Dr. Alan Greene explains why obesity is a serious health problem for kids. The health care provider will perform a physical exam and ask about your medical history, eating habits, and exercise routine. BMI is calculated using height and weight. You and your provider can use your BMI to estimate how much body fat you have. Your waist measurement is another way to estimate how much body fat you have. Extra weight around your middle or stomach area increases your risk for type 2 diabetes, heart disease, and stroke. People with "apple-shaped" bodies (meaning they tend to store fat around their waist and have a slim lower body) also have an increased risk for these diseases. An active lifestyle and plenty of exercise, along with healthy eating, is the safest way to lose weight. Even modest weight loss can improve your health. You may need a lot of support from family and friends. Learn ways to manage stress other than snacking. Examples may be meditation, yoga, or exercise. If you are depressed or stressed a lot, talk to your provider. You may see ads for supplements and herbal remedies that claim they will help you lose weight. Some of these claims may not be true. And some of these supplements can have serious side effects. Talk to your provider before using them. You can discuss weight loss medicines with your provider. Many people lose at least 5 lb (2 kg) by taking these drugs, but they may regain the weight when they stop taking the medicine unless they have made lifestyle changes. Surgery alone is not the answer for weight loss. It can train you to eat less, but you still have to do much of the work. You must be committed to diet and exercise after surgery. Talk to your provider to learn if surgery is a good option for you. 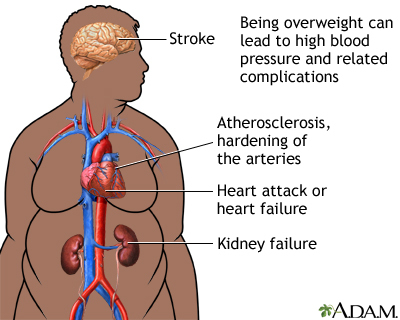 Obesity is a major health threat. The extra weight creates many risks to your health.